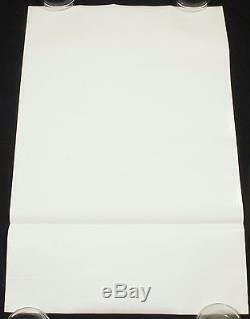 STAR WARS 1977 Original Movie Poster Style A TRI-FOLD FIRST PRINT NSS 77-21-0. This STAR WARS One Sheet Movie Poster is the STYLE A Original Vintage 27"x41" issued by 20th Century Fox during the film's theatrical release in 1977 and features artwork by Tom Jung. This is not a bootleg, reprint or reproduction. This STAR WARS STYLE A One Sheet Movie Poster has had four printings. The first has the NSS Number 77-21-0 at the bottom, the second and third printing has just the 77-21 NSS number at the bottom with the type: Style "A" printed to the left of it, and the fourth printing has the 77-21 NSS number with the Star Wars type underneath it. 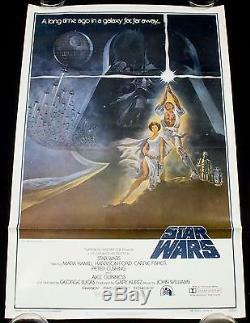 The STAR WARS STYLE A Movie Poster offered here is the FIRST PRINTING NSS NUMBER 77-21-0 released in 1977. The STAR WARS STYLE A 1977 TRI-FOLD FIRST PRINTING NSS 77-21-0 One Sheet Movie Poster is in Very Fine/Near Mint Condition. The poster is bright white and glossy. Theres some small tears at the top right white border and some wear in the white border at the left bottom. The center image has beautiful vibrant color and theres no finger dents or other wear in the image area. There's no pinholes, rips, stains, tape, smudges or writing on the Poster. The Tri-Folds are very strong with no wear and no splits. The back of the poster is nice. I've had this Poster since the original release of Star Wars, though bootlegs were still made around this time. I spent several hours researching the Star Wars Movie Posters to make sure this is an Original Poster, which it is. Bootlegs have a thin "hair" printed underneath Luke's belt and this STAR WARS STYLE A NSS 77-21-0 does not have this. With more Star Wars Movies being released this poster will continue to be popular and collectible. All items come from a smoke free home. The item "STAR WARS 1977 Original Movie Poster Style A TRI-FOLD FIRST PRINT NSS 77-21-0" is in sale since Saturday, April 23, 2016. This item is in the category "Entertainment Memorabilia\Movie Memorabilia\Posters\Originals-United States\1970-79". The seller is "the-phantom-zone" and is located in Los Angeles, California. This item can be shipped to United States.